Selecting a Hyundai Certified Pre-Owned (CPO) vehicle is a confidence-inspiring choice. Why? Because Hyundai CPO vehicles come with a manufacturer-backed warranty, are high quality, and in like-new condition. They're also inspected by technicians at Hyundai dealerships to a 150-point* standard specified by Hyundai Motor America. Which means there's less to worry about now and down the road. Have a clean, non-branded title as verified by a CARFAX Vehicle History Report Hyundai Certified Pre-Owned Vehicle History Report. Comprehensive 150-Point* quality assurance inspection. All Hyundai Certified Pre-Owned (CPO) vehicles are backed by Hyundai Motor America (HMA) and include the remainder of the 10-Year / 100,000 Mile Powertrain Limited Warranty†‡. Hyundai CPO vehicles are inspected by technicians at Hyundai dealerships to a 150-point* standard specified by Hyundai. Only HMA can offer a powertrain limited warranty on a Hyundai CPO vehicle. Repair service is available nationwide through any authorized Hyundai dealership in the United States. 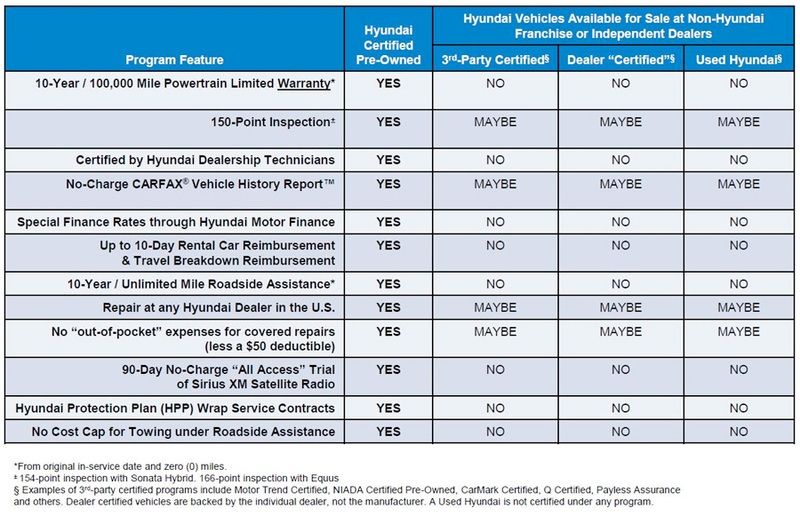 Additional benefits of Hyundai CPO ownership include: a no-charge CARFAX Vehicle History Report; 10-Year / unlimited mile roadside assistance; rental car and travel interruption reimbursement; special financing rates through Hyundai Motor Finance; and 90-days of no-charge SiriusXM satellite radio "All Access" trial. +From original in-service date and zero (0) miles. *154-Point Inspection for Sonata Hybrid; 166-Point Inspection for Equus. ‡$50 deductible per repair visit applies.